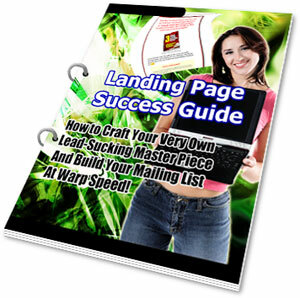 The landing page system provides a uniquely powerful system through which you can derive profit from multiple streams. This article will briefly discusses some of those different streams – and how you can manipulate them. Let's start with the landing page itself: all traffic is sent to the landing page. From there, it will have a number of options, depending on what you have given them. Many marketers suggest that your landing page should always be an opt-in form. Others will suggest that it should simply be a sales page. Whether it's a free newsletter or a product for sale, the landing page system you create should include a “one time offer,” which will compel them to take action – subscribe, buy, etc. Once they subscribe or buy, the landing page system you create should then re-route them to a thank you page, which opens up more means through which you can up-sell. One quick way to up-sell is to simply include advertisements on your thank you page for related affiliate products or for your own products. Here, again, you will want to give them a one-time offer. Also, if you haven't yet asked them to join your mailing list, this is where you should do it – on your thank you page. Once they opt-in to your list, you now have a whole new option you can use in conjunction with the landing page system to generate revenue.